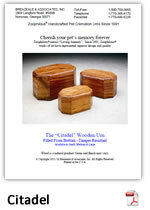 Have you seen and held the handcrafted quality of a Citadel™ Cremation Urn? Each urn in the Citadel™ Line is crafted out of beautiful, natural wood and is hand finished in our Georgia Studio. Every urn is unique, with the natural wood grain displayed in a warm oak finish. These urns have an octagonal shape and come in four sizes. Each urn is designed to be filled from the bottom with a tamper resistant seal. Each urn is individually boxed for mailing. 7.5" x 5" x 4"
3" x 2.5" x 2.25"